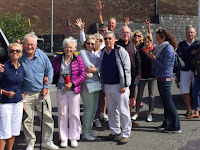 It was sun, sun, sun, all the way as the second GSGB group headed to the Donnafugata Resort and Spa near Comiso in Sicily in October hosted by Gary Pike and Brenda Ferriman. Over the ten day tour we played five team competition games mimicking those played by the first group, and lots of fun was had by all. The girls dominated the proceedings with various winners; however Sue Brooker should have special mention as she was part of the winning team each round! Well done to Sue. Over the tour we also allocated everyone’s team points to each player creating an overall Ladies and an overall Mens winner. These were won by Spike (Dave) Brooker for the Men and surprise, surprise by Sue Brooker for the Ladies. Well done to both of them. Another highlight as co host Gary Pike reckoned he had done something very silly! We arrived back in the Club House to a glass of prosecco as he had holed his tee shot for a hole in one on the long par 3 third hole on the Links Course. Several bottles of prosecco duly followed as Gary was delighted to record his 4th career hole in one. 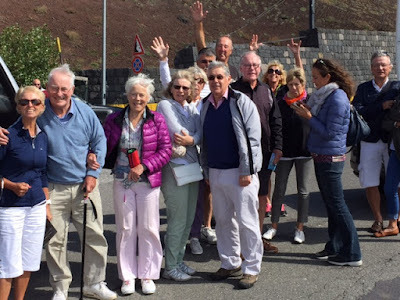 Other than golf, we enjoyed a day tour to Mount Etna (a little chillier at this altitude!) followed by lunch at a delightful winery with the odd glass or two and finishing the day at amazing Taormina with its spectacular Roman Amphitheatre, shops and restaurants, bathed once again in spectacular sunshine ... a great day out. Great nights dining were enjoyed at either the ‘Surf and Turf’ Grill, Il Carrubo fine dining and the very popular Trattoria restaurants, where al fresco dining on the patio was great fun. Visits to the nearby town of Scilogti and Il Sac Alleo, an amazing fish restaurant was enjoyed by most of the group and some twice, as the freshly caught and freshly cooked catch of the day was such an amazing experience. Our Sicilian adventure came to an end as we returned to a very chilly autumnal U.K.